story © Michael Betancourt, April 12, 2015 all rights reserved. This article is a revision of my article from Vague Terrain published several years ago. Figure 1. Illustration of a cat organ from Jean-Baptiste Weckerlin in his 1877 book Musiciana, extraits d’ouvrages rare ou bizarre, 1877. These ideas of 'autonomous achievement' appear in the social realm through fantasies of autonomy—the “self-made man”—independent of the social reproduction that makes their success and survival possible. This imaginary autonomy elides human labor from production, apparently rendering human agency obsolete in the digital information economy, and authorizing the valorization of social behavior. The active principle for these transformations is the ‘aura of the digital,’ which reifies capitalist ideology by masking the role and importance of an underlying physical reality. In its place is a corrosive fantasy that digitality has opened up a magical realm beyond physical constraints, where the duality of production/consumption is resolved to allow growth without limit—the continual expansion of wealth—beyond the constraints of production, materiality, and labor. When the King of Spain, Felipe II was in Brussels in 1549 visiting his father the Emperor Charles V, each saw the other rejoicing at the sight of a completely singular procession. At the head marched an enormous bull with a little devil sitting between his horns juggling fire. Prancing in front of the bull was a young boy sewn into a bear skin riding on a horse whose ears and tail were cut off. Then came the archangel Saint Michael in bright clothing, and carrying a balance in his hand. 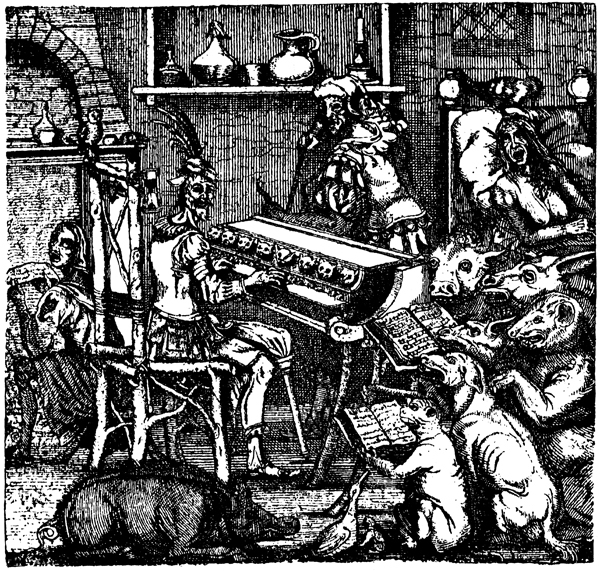 This abominable orchestra arranged itself inside a theater where monkeys, wolves, deer and other animals danced to the sounds of this infernal music. Quand le roi d’Espagne, Philippe II, vint à Bruxlles en 1549, pour visiter son père l’empeur Charles-Quint, on vit entre autres réjouissances, une procession des plus signulières. En tête marchait un énorme taureau qui lançait du feu par ses cornes, entre lesquelles était assis un petit diable. Devant le taureau caracolait un jeune garçon cousu dans une peau d’ours et monté sur un cheval auquel on avait coupé la queue et les oreilles. Puis venait l’archange saint Michel dans de brillants atours, et tenant une balance à la main. Le plus curieux était un chariot qui renfermait la plus singulière musique qu’on puisse imaginer. Il y avait là un ours qui jouait de l’orgue; en guise de tuyaux, une vingtaine de boîtes assez étroites renfermaient chacune un chat; les queues sortaient et étaient reliées aux touches du clavier par une ficelle, si bien que, quand on pressait l’une de ces touches, la queue correspondante se trouvait fortement tirée, et produisait chaque fois un maiulement lamentable. Le chroniqueur Juan Christoval Calvète, ajoute que les chats étaient rangés de façon à produire la succession des notes de la gamme… (chromatique, j’aime à croire). Cet orchestre abominable était suive d’un théâtre sur lequel dansaient au son de cette musique infernale des singes, des loups, des cerf et d’autres animaux. On peut lire la relation de cette procession dans le livre sur les Représentations en musique du Pére Ménestrier (1681), et dans les Denkwürdigkeiten de Samuel Bauer (1830, tome XI). The details of the cat organ present it clearly as an instrument cat lovers might wish was a fictional horror, much like the “mouse organ” on Monty Python’s Flying Circus. It produces katzenmusic by torturing live animals as a productive means, causing them to mew on demand: literally cat-calls that are not merely cat-calls, but something more—a form of music semiotically reassembled from the distinct voices controlled by the device. As Weckerlin’s description of the procession shows, the cat organ functions symbolically, based on the association of cats with devils and an immaterial, supernatural order where normally antithetical animals come together in a peacable kingdom. This separation of source from meaning relfects the action of a semiotic process. The cat organ produces a magical transformation of animal noise into harmonious order; and the procession dramatizes an immaterialist theory. It is a demonstration of ‘Godly might and universal design,’ thus forcing immaterial forces into an immanent presence, presented through technical instrumentality: the angel Michael imposes a heavenly order that drives demonic forces before it. Enacting this order requires a systematic denial of the actual physicality of its means: the live animals encased in the katzenkavalier. The specific subordination enacted by the cat organ is at one and the same time an expulsion from consciousness, it is an earlier form of the same blindness which is the aura of the digital, stripping concerns with physicality from consideration. This separation of source (material basis) from meaning reflects the action of a semiotic process. To Weckerlin and contemporary audiences, the horror of this machine lies with the fact that individual animals are significant to the device only in so far as they stand-in for the specific pitch they produce—in effect, they are living samples of abstract musical tones. This transfer is significant to understanding the device’s relevance to contemporary technology: the cat organ finds its parallel in the software application AutoTune where any voice can be correctly tuned to be perfectly in pitch, a transubstantiation of ordinary voices into pure musicality. In arranging live cats so the timbre of their voices would at one and the same time become the various pitches of a musical composition, the cat organ implicitly reifies an understanding of physical reality analogous to contemporary digital sampling and fragmentation; it reflects a specifically digital conception of physicality: the operative procedure is semiotic, the results dependent upon the reorganization of a collection of data samples. The katzenkavalier is thus an early symptom of the digital both conceptually and in approach: sampling, via the fragmentation of physical reality into discrete packets (the individual cats), for semiotic reassembly and manipulation as a new product: (katzen)music, an immaterial form whose existence only comes into being through a mechanical apparatus of performance-torture that renders the semiotic transformation of cat’s mewing into abstract musical form. The cat organ reappears (quite literally) in the 1990s as a pair of Christmas albums by the group Jingle Cats. They were a popular sensation—their first album, Meowy Christmas, was completely sold out at Christmas in 1993, and followed in 1994 with Here Comes Santa Claws, both albums feature music “sung” by cats’ meowing on key. As the “Jingle Cats” website notes, in a disturbing reflection of the original cat organ’s basis, the music was created using real cats. This was possible because of digital synthesizer technology that could sample actual cat’s mews and then adjust them to be on key, thus allowing the use of real cats in the performance: these albums repeat the semiotic procedure of the cat organ. Both are symptomatic of the ability of digital technology to fragment a continuous physical reality into discrete packets allowing the disassociation from their source, the disassembly into component elements, and their reassembly as only the relevant data. Thus, an autonomous protocol neutrality enables and proceeds without concern for the physicality of the material translated to digital form. Figure 2. Illustration of a cat organ from Gaspar Scott, Magia Naturalis, 1677. This neutral protocol so clearly on view in the cat organ is also a machinic one that incorporates the living into the non-living: cats encased in the instrument of their torture-performance is itself distinctly and specifically cybernetic. In this cybernetic dimension is a analogue to the digital transferal (and surrender) of human agency to the automated and digital computer where particular human concerns become data in the reconfiguration of social space to reflect the valorization process central to the financialization of digital capitalism. Apparent even in the historical cat organ, is the concept of the “aura of the digital.” This neutral protocol so clearly on view in the cat organ is also a cybernetic (machinic) one that incorporates the living into the non-living: cats encased in the instrument of their torture-performance. This cybernetic dimension is an analogue to the digital transferal (and surrender) of human agency to the automated and digital computer where particular human concerns become data in the reconfiguration of social space to reflect the immaterial valorization of digital capitalism. Torture is at the foundation of this technical apparatus. The cat organ’s sampling process—where the animals as such become insignificant to its meaning and purpose, but essential to its form—is inherently contained within the foundational procedure of the digital, reflecting the same stripping of physicality from conscious awareness that is essentially the aura of the digital. That there is an ethical concern in relation to this historical infernal device’s use of sampling—the necessary foundation for the digital semiosis—implies a similar ethical dimension and critique may be relatable to the aura of the digital’s occlusion of physicality from consciousness. These ethical questions are emerging, however, not from the manipulation of sampled animal voices, but in the aftermath of the “Housing Bubble” of 2008 where the sampled and semiotically manipulated materials were at once both less tangible (securitized debt) and immanently visible (the human impacts). The dilemma posed by ethical questions about an instrumentality lies with that technologies’ fundamental ambiguity, an element that inheres to its aspirations towards the state of information: to pose an ethical problem for one also opens the other to the same questioning. Calvete de Estrella, Juan Christobal. El Felicisimo Viaje del Muy Alto y Muy Poderoso Principe Don Felipe (Madrid: La Sociedad de Bibliofilos Espanoles, 1930), pp. 73-77. Weckerlin, Jean-Baptiste. Musiciana, extraits d’ouvrages rare ou bizarre (Paris: Garnier Freres, 1877) p. 349. Monty Python’s Flying Circus, “Arthur Ewing and His Musical Mice” Season One, Episode Two. Bertlestein, Lance. “Journalism, Carnival, and Jubilate Agno” in ELH, vol. 59, no. 2 (Summer, 1992) p. 375. Jingle Cats website, http://www.jinglecats.com/, retrieved 12/01/2010. Copyright © Michael Betancourt April 12, 2015 all rights reserved.